AN EZ-FLASHER CUSTOMER HAS REPORTED THEIR UNIT STOLEN. PLEASE REPORT ANYONE TRYING TO SELL S/N:EZ-0110. PLEASE REPORT ANYONE TRYING TO SELL S/N:EZ-0026. EVERY UNIT SHOULD HAVE AN ADHESIVE LABEL WITH SERIAL NUMBER PLACED ON THE SIDE COVERING BOTH TOP AND BOTTOM PARTS. IF THIS LABEL IS MISSING, PLEASE LET US KNOW. THANK YOU FOR YOUR INTEREST IN THE EZ-FLASHER! 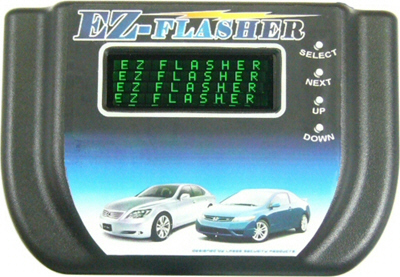 Laser Key Products was instrumental in the EZ Flasher development. 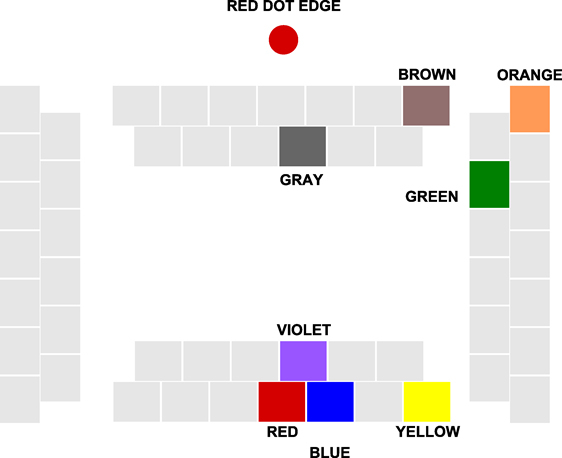 For technical support you must contact the place of purchase. Sorry, but this site is for manufacturing information only! Please click on the version number on the left for more detailed information. Thank you for visiting the EZ-FLASHER re-flash tool information site. This site allows you to track the updates made to the EZ-FLASHER programmer. Please visit the Contact page if you require information other than support. Thank you. The EZ-FLASHER will program ECU's & Immobilizer ICU's for Honda, Lexus & Toyota automobiles. It can also read the PIN code on certain Isuzu models. No laptop or desktop computer is required. The EZ-FLASHER is self-contained and plugs into a typical cigarette lighter. Updates are made through purchased SD memory cards. E Z Flasher manual update, Chrysler Skreem PIN read (Rough Draft) PDF download. E Z Flasher manual update, Chrysler type 1 PIN read (Rough Draft) PDF download. Required pulling off the wire on Pin 6 when programming an 93C66A on units with serial numbers greater than 050. This signal is not needed for programming any 93CXX part in a module. Added DELCO ECU programming feature for Toyota. Fixed a bug for repairing a failed update procedure. Increased programming speed (8X) on most ECU's. Added SN display in config menu. It was supposed to fixed - this should be the final fix. All previous versions will fail to program some Honda/ Acura immobilizers units. Faulty feedback continued the IC900 programming error. It really is fixed this time. Appologies to our customers on this long awaited fix. Available as a purchased upgrade. Fixed Chrysler Type 1 PIN display (was reversed). Fixed IC mode problem when switching between serial ROMs. SKIM 1: Can RESET LOCKOUT if too many attempts made. Fixes Isuzu READ operation. Power was not applied to IC. Time out flag wasn't cleared properly. This content is gathered from feedback from users like you or from user questions. For upgrade versions only: If constant "Data Is Questionable" errors, try power cycling the unit. This has been fixed in 1.35b. The numbers after an ERROR can indicate a bad connection or the board itself is interfering with programming. The numbers actually indicate the number of bad compares from what is in the chip to what should be progammed. They van range from a low number to 255. A value of 255 indicates not a single byte was programmed. If running into constant programming errors, try grounding the crystal closest to Pin 1 of the memory IC IC900. This is indicated by the error number changing. Error: "Time Out" indicates a very poor connection.